System settings of GPS in your device are superior to all Locus GPS settings - the system GPS being turned off or if Locus does not have permission for accessing GPS (e.g. for battery-saving reasons) especially in stand-by mode may result in incorrect GPS positioning that influences many Locus features. Check your system settings first! Allows to choose either built-in hardware compass or GPS-calculated azimuth for orientation that is essential for map rotation and the compass screen. Hardware compass - more suitable for slower speeds, e.g. walking, as it does not require movement to detect direction unlike GPS. Mobile hardware compass is very sensitive on nearby magnetic metals and may display malformed values in their close presence, e.g. magnetic flip-cases or steel steering bars. Orientation via GPS - more suitable for car navigation due to magnetic components in the car that can affect performance of the hardware compass. Auto-change - shifts bearing automatically between hardware compass and GPS according to pre-defined critical speed. Sets navigation by true bearing instead of magnetic bearing. Orientation is computed by an alternative method. Suitable for some devices. Notifies when your device acquires GPS location. Opens notification settings screen with several options to define the sound and vibration alert (beep, any sound from your phone library…). Notifies when your device loses GPS location. Opens notification settings screen with several options to define the sound and vibration alert (beep, any sound from your phone library…). Keeps GPS on during the track recording even if the recording is paused. Keeps GPS on during guidance even if the app is minimized and screen is off. Launches the Bluetooth manager to enable GPS from a bluetooth device instead of the internal GPS. The advantage is better GPS accuracy and lower phone battery consumption. GPS update interval - sets time interval of GPS switching on and locating the device. Values of more than 60 seconds save battery life. Min accuracy - sets minimum GPS locating accuracy to keep GPS on. When the accuracy is lower due to few detectable satellites, the GPS turns off. Max search time - sets maximum time of GPS signal searching. If the GPS fix is not secured within this period, GPS turns off. Keep auto-off enabled - keeps GPS auto-off enabled even if Locus Map is active and screen is on. More stable and battery efficient location method on some devices. 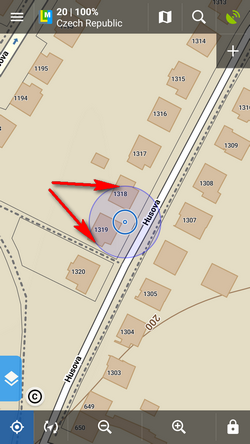 Using Fused Location Provider for getting location of the device. Fully functional provided Google Services have GET_LOCATION permission.